This is my first SketchCrawl, and since I couldn't find a group near me, I decided to go solo. I did "A Day in the Life ...", starting with the view I see every morning when I wake up, and my sweet golden retriever, Buckley. I'm lucky to live out in the country, and I had fresh-picked red raspberries for breakfast, which I also drew. I had to go into town and do some errands, so I took the opportunity to sketch a scene that I see several times a week and always think, "Gee, I should sketch that one of these days." So yesterday I did! Our nearest town is the thriving metropolis of Waynesburg, PA. Here's a view of the main street. After supper, I took the dogs for a walk and sketched the view looking back at my house. 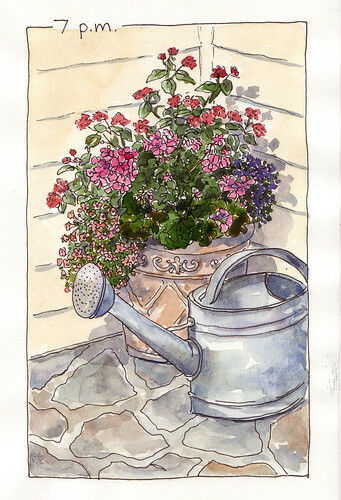 Last, but not least, a pretty pot of flowers on the patio. I did all of the sketches and about half of the painting yesterday, then finished up the rest of the painting today. It was a lot of fun - can't wait for the next event! You say you're lucky to live out in the country, but it's your sketches that prove it. My favourites are the 'Greene County Barne' and '3pm Waynesburg PA', but they're all charming. Great style and perspective (especially the town street scene). Oh to be that good! Leslie, so nice to see the landscapes of your home place and the view of Prosperity downtown. So much detail and narration and still so sweet interpretation. it really leave a sense of peace watching your sketches. 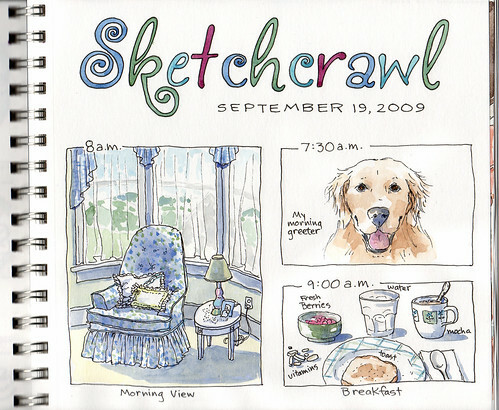 Beautiful sketches of an idyllic day-in-the-life. While I love the social nature of sketchcrawls, I also appreciate the act of going solo - it can be a wonderful meditation. Well done!! wowow your sketches arre really really nice ! brightness color, fine line, good layout!!! perfect!!! 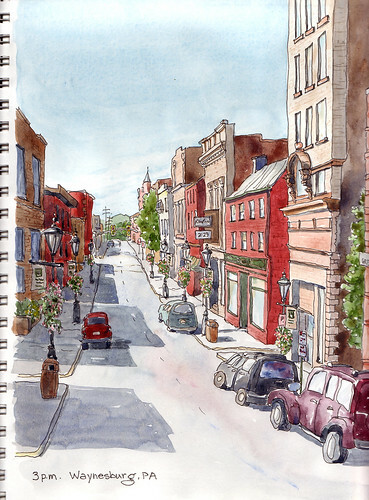 Small Pennsylvania towns and the surrounding countryside make for some interesting sketches. Nice job on your solo sketchcrawl. You have some excellent sketches there. Thanks so much for all your encouraging comments! I feel privileged to be in the company of such a fine group of artists. I can't wait for the next SC! These are really wonderful Leslie F! Thanks for sharing. Love the view of the main street, looks like a clean, peaceful place.